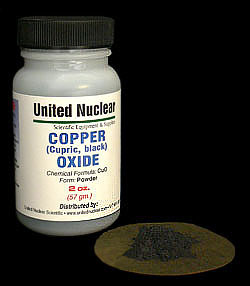 Black Copper Oxide, also known as Copper (II) Oxide, is used as a catalyst in various chemical reactions and also to purify Hydrogen gas. It finds use in superconductivity research as a component itself, and to produce other compounds used in superconductive materials. In pyrotechnics, it is used as a catalyst in novel blue strobe rocket propellant formulations, and in general to impart a blue color to flames. Strobe rocket propellants burn intermittently, producing a rapid series of bursts of thrust, as opposed to a conventional continuous burn rocket propellant.